After you have imported your favorite sounds into your Adobe Flash CS6 document, you can place them on keyframes along the Timeline to have them play at specific points in your movie. You can assign sounds with the Property inspector, which displays the Sound section when a keyframe is selected. Sounds can be combined across different layers and used inside buttons to create sound effects for controls and navigation menus. On a new layer, create a blank keyframe along the Timeline and launch the Property inspector (if it’s not already visible). On the right side of the Property inspector, locate the Sound section and select a sound from the Name drop-down list. This drop-down list shows all sounds in your library. The sound is now placed on your Timeline. Press Enter or Return to play your movie. The sound plays when the playhead reaches the keyframe. Note: If you are placing a sound on Frame 1, you may not hear sound playback unless additional frames follow it. If you need to preview a sound on a single frame timeline, Press Ctrl+Enter (Windows) or Command+Enter (Mac) to test your movie and hear your sounds. Press the Esc key to stop sound playback when previewing (very helpful if you fire off too many sounds at once!). After you place a sound on your Timeline, you can use additional options in the Property inspector to control looping, repeating, and playback performance. The most common options to experiment with are the Repeat and Loop options, which control the number of times (if any) a sound should repeat when it’s played. Select the keyframe where you already have a sound placed and locate the Sound options in the Property inspector. Locate the Repeat drop-down list and enter the number of times you want the sound to repeat in the text box to the right. By default, the sound repeats at least once, but if you enter 2, for example, your sound repeats twice. The sound you placed plays and then repeats the number of times you entered in Step 2. 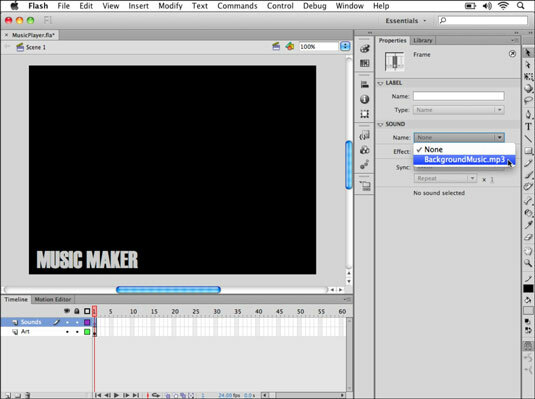 Select the keyframe and, with the Sound options, click the arrow beside Repeat and choose Loop from the drop-down list. The sound is now set to loop continuously until the movie is shut down or another action turns it off. Choose File→Publish Preview→Flash to preview your movie. The sound plays and then continues to repeat until you close the preview.